Located a short 1.5-hour drive from Fairbanks, Chena Hot Springs (www.chenahotsprings.com) sits at the end of a well maintained two-lane road. Founded by gold miners Robert and Thomas Swan in 1905, the soothing waters quickly took away Robert’s painful rheumatism symptoms, after which Chena soon became a favorite haunt of the Fairbanks locals. And although this historic site dates back well over 100 years, access upgrades have been continually added, so today everyone can enjoy the healing waters. It’s the perfect place to take a break, spend the day and enjoy Mother Nature at her finest. Although it’s not exactly easy to make natural sites accessible, the folks at Chena Hot Springs have done a good job. Accessible parking is located next to the office, and from there it’s a short level roll over to the hot springs entrance. Admission is a very reasonable $15 for adults or $13 for seniors (over 65), and it’s good for the whole day. There’s barrier-free access to the men’s and women’s locker rooms, and each side contains an accessible toilet stall with grab bars, and a shower with grab bars and a portable shower chair. There’s also a family restroom on the far side of each locker room, and although they are certainly very roomy, they lack toilet and shower grab bars. Still, the locker rooms have room enough for even the largest wheelchair, with good access to the shower and toilet areas. There’s level access from the locker rooms to the inside pool area; and although there’s plenty of room for a wheelchair, it’s largely a kid’s water play area. Outside, the deck is designated as a quiet area, and there’s level access to the hot tub which has a portable lift. There are also a few tables on deck if you’d just like to chill and enjoy the scenery. Although the deck is nice, by far the Chena highlight is the rock-lined hot springs itself. There’s ramp access down into the spring, with a railing alongside the ramp for slow walkers. And if you’d rather roll, there’s also a water wheelchair available. At the end of the ramp you can transfer to a bench or just swim over to a nearby rock. There are also a number of rocks to perch on alongside the ramp, in case you don’t want to go all the way in the water. The pool is quite large, and depending on the location the temperature ranges from warm to very hot, so you just have to move around to find the ideal spot. There’s also a misting sprinkler in the middle, if you want to cool down a bit; as well as a heavy stream of water flowing down one wall if you want some extra pressure on a back or neck knot. And if you’d like the spring to yourself, go in the early morning, as the overnight guests tend to sleep late. Chena Hot Springs is also an excellent place to view the Aurora Borealis — the Northern Lights. 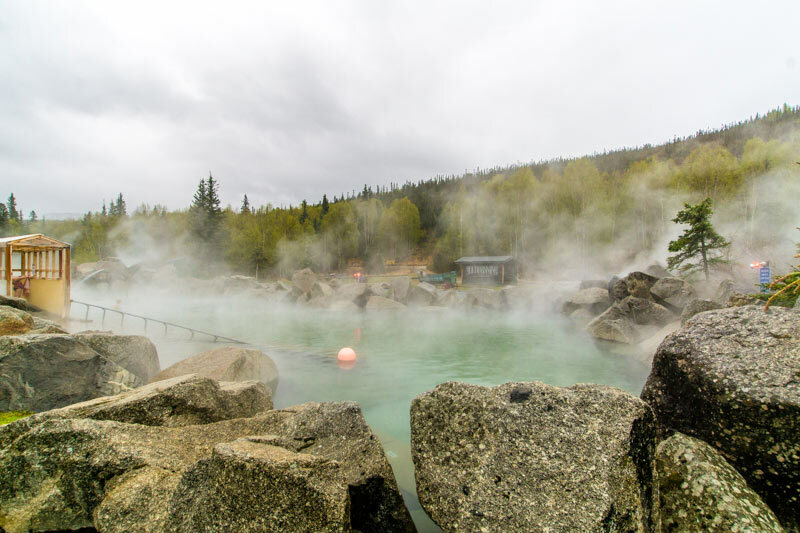 Typically the best viewing time for this phenomena at Chena Hot Springs is between August and May, from 10 p.m. to 3 a.m. And that works out just fine, because the pool is open till midnight. So go soak during the day, have a bite to eat at the hotel restaurant and then return to enjoy the springs in the evening. Seeing the Aurora Borealis is truly a once-in-a-lifetime experience, and there’s no better place to do it than at Chena Hot Springs.